WASHINGTON — Los Angeles County is spending more than $26 million a year to hold undocumented immigrants under a federal immigration enforcement initiative, individuals it would otherwise release, according to a report on Thursday. Critics say that demonstrates the high cost of the program, in which some local governments would rather not participate. The report by Justice Strategies found that the cost of Secure Communities, a cooperative program between local police and Immigration and Customs Enforcement, is steep mainly because jails hold suspected undocumented immigrants are held an average of 20 days longer at ICE’s request than they otherwise would. The advocacy group examined public records from the Los Angeles County Sheriff’s Department provided to the National Day Laborer Organizing Network. Extending those numbers statewide, Justice Strategies estimates that California taxpayers spend $65 million each year to detain immigrants for ICE. Los Angeles County first signed on to Secure Communities in August 2009, when the program was just gearing up. The initiative is now in force in 97 percent of the country — 3,074 of 3,181 jurisdictions — with the goal of 100 percent application by the end of the year. As Secure Communities expanded, it became increasingly controversial, from its troubled rollout to concerns that it nets non-criminals and makes communities fearful of police. The program works by sending fingerprints of arrested individuals to ICE, which uses them to screen for deportable immigrants. If ICE finds a match, the agency asks local law enforcement to hold the person until federal authorities can come pick up the arrestee. Those holds, called detainers, are supposed to last 48 hours. But in Los Angeles County and many other jurisdictions, jails often end up holding immigrants far longer, generating costs that aren’t reimbursed by the federal government. ICE insists the detainers are important for public safety, even though the criminal justice system would release the individuals in question if they were not under a detainer. California may soon have a law barring the detention of immigrants “after that individual becomes eligible for release from criminal custody,” except in certain circumstances. Los Angeles Mayor Antonio Villaraigosa supports the legislation, called the TRUST Act, which it has passed in slightly different forms in the state assembly and the state senate. It could soon go to Democratic Gov. Jerry Brown’s desk, although he hasn’t yet said whether he will sign it. Similarly, Cook County, Ill., and the District of Columbia have passed measures against holding undocumented immigrants for ICE when they otherwise would be released based on the lack of severity of their accused crimes. ICE offered to pay Cook County for the expenses incurred, according to the Chicago Tribune, but county leaders didn’t budge. To date, ICE has deported 59,535 immigrants under the Secure Communities program, according to the agency. The Justice Strategies report found that 5,184 people were handed over to ICE by the Los Angeles County Sheriff’s Department in the first three months of 2011. Los Angeles Sheriff Lee Baca has declined to answer other questions about the operation of the program, despite a lawsuit brought by the National Immigration Law Center and the National Day Laborer Organizing Network. The Los Angeles Times released an editorial on Tuesday criticizing Baca for his refusal to release numbers about the demographics of county jails and the extent of his office’s cooperation with ICE. This entry was posted in Press (California) on August 27, 2012 by Ian. An Indian American computer analyst, who has been a U.S. citizen since his parents adopted him as a newborn from a Kolkata, India orphanage, filed suit against several federal agencies July 3 for branding him deportable. James Aziz Makowski, 25, is the first U.S. citizen to challenge the Secure Communities program, which allows federal agencies to exchange information with the aim of finding serious undocumented criminals and deporting them. Civil rights activists have long opposed S-Comm, as the program is colloquially known, saying it violates the privacy rights of individuals. Makowski’s suit names U.S. Attorney General Eric Holder, FBI director Robert Mueller, Department of Homeland Security Secretary Janet Napolitano, and Immigration and Customs Enforcement director John Morton, among others. “I just want the U.S. government to put in safeguards to ensure that citizens and permanent residents are not subject to being detained for immigration issues,” Makowski told India-West in a telephone interview. On July 7, 2010, Makowski was arrested for making and distributing heroin. When he was arrested, the Dupage, Ill., county sheriff’s department sent his fingerprints to the FBI for a background criminal check. Under the provisions of S-Comm, the FBI turned Makowski’s fingerprints over to ICE. Mark Fleming, an attorney with the National Immigration Justice Center who is representing Makowski with Geoffrey Vance of McDermott Will and Emery, told India-West that Makowski had been naturalized through his parents shortly after arriving in the U.S., and held a U.S. passport and a certificate of naturalization. But the DHS had not updated their records in 20 years, so that he appeared to be undocumented and deportable. ICE then put an immigration detainer on Makowski, the first step in deportation proceedings. Makowski was never asked about his immigration status, said Fleming. “DHS is now starting to rely exclusively on electronic records, rather than interviewing individuals. They are not taking that extra step to ensure their information is correct,” he stated. While being processed, however, Makowski – through his attorney – learned that he was ineligible for boot camp because of the immigration detainer. He spent the next two months in prison while his father tried to get him out. “It was definitely the most unpleasant experience of my life. I was very depressed. Nobody seemed to care that I was a U.S. citizen,” said Makowski. Since his release, Makowski – who sold heroin to support his cocaine habit – has gone through drug rehabilitation and is clean and sober and employed. The Robert Morris University graduate said he started experimenting with drugs while in college, but soon found himself addicted. While in jail, before he pleaded guilty, Makowski alleged he was questioned several times by FBI counterterrorism agents, who would ask him about his affiliation to India, and whether he had visited the country and if he sent money there. FBI agents also asked him if he attended mosques and what languages he knew besides English. 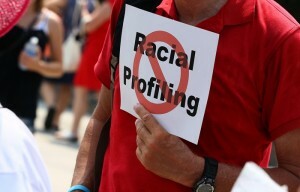 The Indian American believes he was questioned because of his middle name – Aziz – which he has retained. He has never visited India nor been to a mosque. Under S-Comm, any time an individual is arrested, his fingerprints are sent to the FBI, and then automatically to DHS to see whether there are grounds for immigration enforcement, Fleming explained, adding that S-Comm is the first step in a larger program known as the Next Generation Identification System, which he characterized as a “one-stop shop” for various law enforcement agencies, which could potentially bring in the IRS, the Social Security Administration and even child support agencies. According to the lawsuit, the FBI in the past decade has sent 16 million fingerprints to ICE, of which 15 million belonged to U.S. citizens or legal residents. Anoop Prasad, a staff attorney at the Asian Law Caucus in San Francisco, told India-West that S-Comm was initiated as a program to root out people who pose a threat to society. But S-Comm has cast a wide net and is detaining people who should not be deported. “S-Comm does not have safeguards to protect U.S. citizens or people who have committed low-level offenses or no offenses at all,” he stated. The program is particularly problematic to victims of a violent crime or domestic violence, said Prasad, noting that those who call the police are also checked against federal databases. “S-Comm has turned the entire country into Arizona,” stated Prasad, referring to controversial measure SB 1070, which requires local law enforcement to demand documentation from those they believe to be undocumented. “Anyone who’s arrested is potentially deportable,” he stated. The California state Legislature is considering the TRUST Act, which would override S-Comm. The bill passed the Senate earlier this month, and is now in the State Assembly, which passed a weaker version of the bill last year. California Governor Jerry Brown has remained mum on the bill, said Prasad. This entry was posted in Press (California) on August 15, 2012 by Ian. Sacramento — Juana Reyes provides for her family by selling homemade tamales outside a busy Wal-Mart not far from where I live. At least she used to. Last month Juana was arrested for selling her tamales without a permit and was held in jail for 13 days, while her two children were placed in foster care. Juana was just released, but she now faces deportation back to Mexico, despite having lived in California for 20 years and being the sole caregiver to her children, both U.S. citizens. I wouldn’t be surprised to read about a story like Juana’s from Arizona or Alabama, where harsh laws direct police to arrest anyone they suspect to be in the country without papers. These laws have been tearing apart families like Juana’s and have immigrant families living in constant fear of police. In California, we may not have an Arizona-style immigration law, but we do have a federal program that’s having a similar effect in immigrant communities. It’s called “Secure Communities,” but the name couldn’t be more misleading. When Secure Communities was started in 2008, it was supposed to end this sort of indiscriminate rounding up of American immigrants. In the absence of immigration reform, Secure Communities was supposed to prioritize the removal of serious criminals. However, the program has strayed far from its original intent. Last year, some 400,000 immigrants were detained and deported, and most of them, like Juana, committed no serious crime. In California alone, 75,000 immigrants were deported last year after being arrested for traffic offenses, selling food without permits or other trivial violations. California can do better. We can focus our law enforcement resources on serious criminals, not on mothers and fathers simply trying to make a better life for their kids. That’s why I support the Trust Act (“Transparency and Responsibility Using State Tools” Act or AB 1081). It’s a bill that would instruct California law enforcement to hold any unauthorized immigrants who are convicted of serious or violent felonies in detention. But, it would mean that mothers, like Juana, who are arrested for trivial violations, or fathers stopped for driving with a broken taillight, won’t be fast-tracked into deportation. This legislation is common sense and it’s the right thing to do. For one, when immigrants fear contact with the police, they don’t report crimes and we all become less safe. Stories like Juana’s quickly spread through immigrant communities and destroy the trust between police and immigrant communities that is so critical to fighting crime. Second, with our state facing an ongoing budget deficit, the Trust Act would help counties lower costs by reducing the money they now spend to hold people like Juana in jail, when they would otherwise be released with a fine. Finally, as a pastor in the Hispanic community, I am constantly confronted with families that have been torn apart when a parent is deported, often times after minor contact with police. The long-term consequences for the children are devastating. The Trust Act passed both the Assembly and the Senate by comfortable margins. Soon it will go to the governor’s desk, and I hope and expect that Gov. Jerry Brown will sign the Trust Act into law. Enforcement of our nation’s borders is essential, and the continuing failure of Congress to enact comprehensive immigration reform and provide a road map to legal status for the 11 million undocumented immigrants in our country is shameful. But, in the meantime, Gov. Brown and California can lead the way by rebuilding trust in immigrant communities, curbing wasteful spending and keeping families intact. This entry was posted in Press (California), Uncategorized on August 6, 2012 by Ian. Juana Reyes is a food vendor and mother of two who was arrested, and detained in immigration jail for two weeks (while her children were taken away and placed in foster care) – all because she was selling tamales in front of a Sacramento Walmart. In fact, she had been a food vendor for years, with no incidents. The trouble only came when a new security guard tried to remove her from the premises, and local police filed trespassing and “interfering with business” charges at her. Just like that, Juana was locked away, even though the state criminal charges were minor and eventually dropped by the local prosecutor. Juana’s story is just one of many stories that point to the civil rights and civil liberties problems created by the Department of Homeland Security’s Secure Communities program, also known as S-Comm. Last week, ACLU members joined other community members in Sacramento to support Juana and to urge the passage of California’s TRUST Act (AB 1081). The TRUST Act, authored by California Assembly member Tom Ammiano, aims to counter the damage inflicted by S-Comm on the state of California. Under S-Comm, anytime an individual is arrested and booked into a local jail for any reason, his or her fingerprints are electronically run through DHS’s immigration database. Based on the results, DHS issues immigration detainer requests to local jails, which result in prolonged detention of Californians held in county jails. This prolonged detention occurs at the point of arrest, before any criminal hearing. Although DHS claims that S-Comm targets dangerous and violent criminals, in fact the majority of people detained and deported through the program have either no criminal records or have been charged with or convicted of misdemeanors only, including traffic infractions. S-Comm is fully operational in every California county. DHS is forcibly deploying S-Comm nationwide by 2013, over the vociferous objections of state or municipal leaders in California, Illinois, New York, Massachusetts, Virginia and the District of Columbia. These state and local leaders have rejected S-Comm because the program ensnares U.S. citizens, people with no criminal records and hard-working parents. 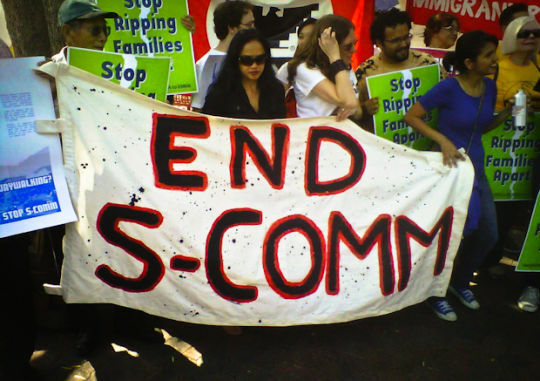 S-Comm has had an especially damaging impact on California. On the whole, S-Comm has resulted in the deportations of over 75,000 Californians – more than any other state. It has torn families apart, made entire communities afraid of reporting crime to the police and threatened public safety. Other jurisdictions across the country have already or are currently attempting to pass measures to limit S-Comm’s harms to civil liberties and public safety. California’s TRUST Act does this by setting a clear, minimum standard for local governments to enforce immigration detainer requests from ICE. Under the TRUST Act, local jails will not undertake this burden unless the individual has a serious or violent felony conviction. That way, California local police and sheriffs will be able to focus on public safety without worrying about the unintended consequences for immigrant community members who pose no threat to public safety. Earlier this month, the California Senate voted 21 to 13 to approve the Act. It already passed the California Assembly by a 47-26 vote and will go back to the Assembly for a concurrence vote following the summer recess before heading to Democratic Governor Jerry Brown. 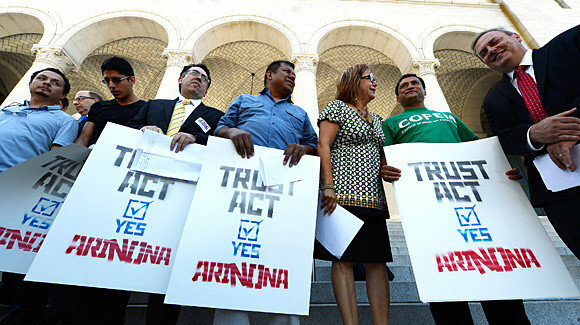 Many news reports are labeling the TRUST Act as the “anti-Arizona” immigration bill because it will lessen the chance of racial profiling of Latinos and other minorities, while Arizona’s SB 1070 does the opposite. On June 25, the U.S. Supreme Court failed to strike down the “show me your papers” provision of the Arizona law. The TRUST Act, if it becomes law in California, could create a national model for states that want to reaffirm that state and localities – not DHS – know best how to protect their communities and to solve local crime. In doing this, states can help restore community trust in law enforcement, bolster the integrity of local police and make all our communities safer. This entry was posted in Press (California), Press Coverage on July 25, 2012 by Ian. All eyes in the immigration debate are trained on California, where the state Legislature is poised to pass a bill that restricts how local and state law enforcement authorities cooperate with federal immigration agents. If approved, the Trust Act would make California the first state in the country to enact a law that limits police to holding only serious and violent criminals for review by Immigration and Customs Enforcement. San Francisco Assemblyman Tom Ammiano wrote the Trust Act to rein in an Immigration and Customs Enforcement program called Secure Communities. Under the program, ICE agents review the fingerprints of everyone that local police arrest. ICE then asks local authorities to place a 48-hour hold on the people federal agents find to be in violation of immigration laws so ICE can pick them up and, frequently, deport them. Federal officials have said the Secure Communities program is a way to rid the country of what they call the “worst of the worst”: undocumented immigrants convicted of serious crimes. Since its inception in 2008, Secure Communities has led to the deportation of 198,000 people, only a quarter of whom are considered serious offenders. In 2011, the governors of New York, Massachusetts and Illinois were so concerned by the number of non-criminals and low-level offenders netted by the Secure Communities program, they told ICE that they would no longer participate. San Francisco’s Ammiano also wanted to get California out of the program and wrote the first version of the Trust Act to allow localities to opt out. However, ICE squashed the backlash by declaring that the Secure Communities program was mandatory. Enter the Trust Act version 2.0. This version would shift the Secure Communities program’s focus back to the worst of the worst. Under the bill, instead of holding everyone arrested, local authorities would honor ICE’s requests only for those convicted of serious or violent felonies. Not everyone agrees with this approach. California State Senator Joel Anderson (R-San Diego) is vice chair of the Senate Pubic Safety Committee. He thinks that undocumented immigrants who commit any crime should be deported. In fact, research shows that immigrants are not associated with higher rates of criminality. Crime rates have dropped dramatically in California and San Diego in recent years. The Trust Act hinges on the belief that ICE’s immigration hold requests are not compulsory and that local law enforcement can choose to honor them or not. Curtis Hill, the California Sheriff’s Association legislative analyst, says his understanding is that the holds are mandatory. He contends that the Trust Act would make local law enforcement choose between enforcing state law or federal law. However, in documents obtained by law schools and immigrants rights groups through the Freedom of Information Act, ICE officials have said that the holds are optional. Angela Chan, who’s a staff attorney with the Asian Law Caucus, says a federal court in Indiana also held that honoring requests for detainment is optional. And then, she says, there’s the Tenth Amendment to the constitution, which” basically says the federal government can’t commandeer the localities and states to do their job for them,” says Chan. ICE will not comment on California’s pending Trust Act. A spokeswoman sent a statement saying the federal government alone determines who is a priority for deportation. The federal agency recently tweaked Secure Communities to exclude people who commit minor traffic violations. At least 15 municipalities and a handful of states are considering reigning in Secure Communities like the Trust Act would. Connecticut, Washington D.C., Santa Clara and Cook County, Illinois already have. In addition to concern about the Secure Communities program’s mission stray, many lawmakers also worry about the program’s cost. For example, a recent study by the American Civil Liberties Union tabulates that on any given day, 2000 inmates in Los Angeles jails are there because of ICE immigration holds. According to the documents obtained recently via FOIA, ICE does not reimburse states and cities for Secure Communities. Sarahi Uribe, with the National Day Labor Organizing Network, says California passing the Trust Act would be a game changer. Governor Jerry Brown’s office won’t say if he will sign the bill, but both proponents and opponents think he will. Another thing both sides agree on is that federal immigration reform would be a better solution. This entry was posted in Events, Press (California) on July 25, 2012 by Ian.